Staffan Ehnbom recently posted an interesting Westerfield Models kit modification on the ResinFreightCarBuilders discussion list. Here are Staffan’s notes. I’ve enjoyed resin modelling for many years. Here’s a recent project. 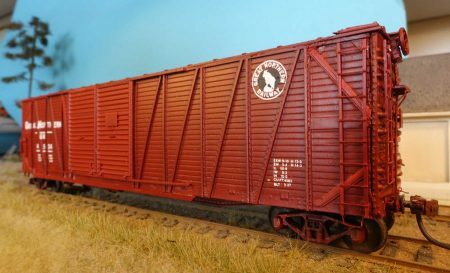 Westerfield provides a kit for Great Northern 42000 series, 1925 vintage automobile boxcars. These cars were originally equipped with 1½ wood doors and Murphy corrugated ends. Photo by Stan Styles from the Staffan Ehnbom collection. 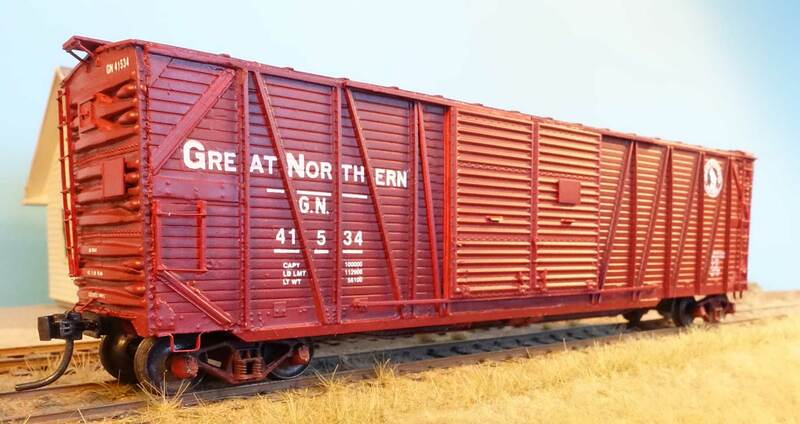 The GN built additional similar cars in 1927 for the 43050-43499 series, but used 3/3/3 Dreadnaught ends with a lumber door in the A-end. Most of these cars were changed to single 6-foot doors in the 1940’s. Some of them were again rebuilt with double 6-foot Youngstown steel doors in 1954 and 1955 and renumbered into the 41525-41999 series. I used the roof and underbody of the Westerfield kit and reworked the sides narrowing the panel to the left of the door opening. A 3/3/3 end from an old Tyco 50-foot plug door box was freed from all the cast-on details and used as a master to cast new resin ends. The lumber door shape was formed with putty. Intermountain Youngstown door castings were installed over the new door opening. We thank Staffan for sharing his Westerfield kit modification. Who knew Tyco car ends could be cleaned up to use as masters for a couple of castings? I’d love to kitbash a similar car, but 1954 is two years after my modeling date. Would you happen to have a photo of a car from the 43050-43499 series with the original double doors that you could include here?